An adorable red panda has vanished from Washington's National Zoo, with helpless zookeepers taking to Twitter to plead for help in finding the little friend. Have you seen Rusty? He's about the size of a raccoon, and he's still a baby. UPDATE: The red panda has been found, zoo officials said this afternoon. Fess up: who stole Rusty the red panda from the National Zoo? Invite me over? 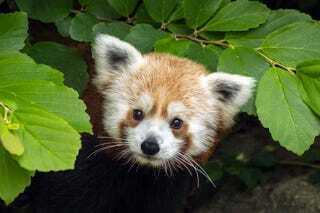 Red pandas are much smaller than their black-and-white cousins, and both are native to China. Rusty is not even a year old, and is no bigger than a raccoon. Was he kidnapped? So far, zoo officials are saying only that they noticed he was missing from his enclosure.